Mid October is a lovely time of year to visit Menorca. The crowds are gone, lodging prices fall, we could ride our bikes comfortably on nearly traffic-free secondary roads, and there were still more restaurants open than we could visit in a lifetime. The heady aroma of flowers around every bend was an off-season surprise and combined with the lush greenery it was spring again. This was our first trip to the island. We had family visiting and we wanted to find a new destination within Spain that would be of interest to everyone. 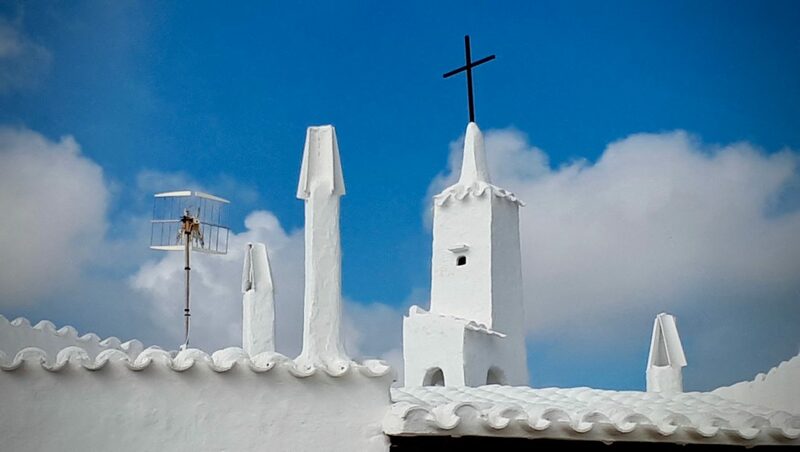 Once we decided on the Balearic Islands, we focused on Menorca because we liked the emphasis on nature. The party atmosphere of Ibiza didn’t appeal to us nor did the population density of Mallorca. With our “nature” island in mind, all we needed was a well-appointed villa with a sea view, close to the airport so we wouldn’t have to rent a car. We found the perfect place in Binibeca Nou, a small village of white washed villas with beautiful sea views on the south east coast. 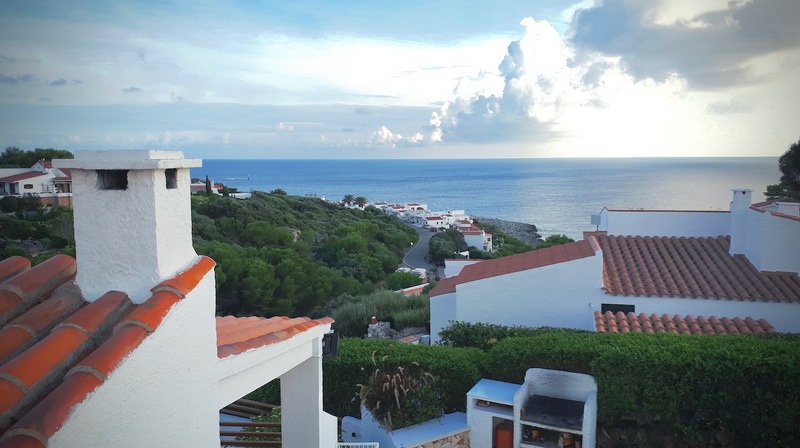 Its older section of town, Binibeca Vell, offers a bigger commercial zone and is just a short bike ride away as is the village of Punta Prima in the opposite direction. This part of the island proved ideal for our getaway. The goal for our laid back Balearic Island vacation was to cycle, explore, and relax. Cycling as an activity worked well. As transportation, it didn’t work. We thought we’d be able to explore the island by bike but the road network just did not facilitate that option. 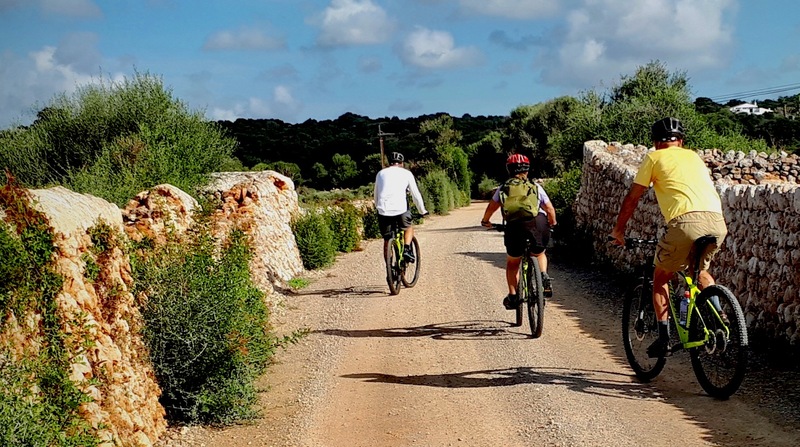 The Cami de Cavalls (a hiking/quasi-cycling trail of 185 kilometers on the perimeter of the island) was not suitable for our cycling, even with good mountain bikes. We tried and quickly realized there were members of our party (me) who could not cycle across and through boulders. I was surprised at the boulders since they never showed up in the advertising pictures. Binibeca is in the region of Sant Lluis, founded during the French occupation of the island. We cycled for a portion of two days in this region and found street signage for four Cami trails: RC-6 - Es Castell-Sant Lluís, RC-68 - Maó-Trebalúger; RC-67 - Sant Lluís-Puma Prima, and RC-66 Sant Lluís-Biniancolla. These Cami trails were fun to ride but covered only short distances before dumping us back on the road. Fortunately, these were quiet, secondary roads and carried little traffic during out October visit. Ciutadella is the oldest city and ancient capital of the island. Our visit to Ciutadella took us on a stroll through the medieval streets past churches, palaces, convents, markets, and other historic spots of interest. We checked out the residential areas and walked out to the end of the port where much of the city’s activities revolve. Like all of Spain, the city is designed for outside café stops and dining al fresco. Boating, beaches, and archeological history all reside in the vicinity of Ciutadella making it also a great holiday destination. Mahón became the capital city when the British captured the island in 1708. It definitely has the 18th century feel. We were told that if we had to make a choice between which city to see, to choose Ciutadella. We’re glad we didn’t have to make that choice because we found Mahón to be just as charming and the port just as lovely. In fact, I learned that the port in Mahón is the biggest natural port in the Mediterranean and second largest in the world (with Pearl Harbor being larger). The one-hour boat tours are highly recommended for seeing the majesty of this port. Upon our arrival at the bus station we set off for Plaza España. We were delighted to immerse ourselves in not one but an endless labyrinth of plazas as we walked toward the port. They’ve done a great job with directional signage throughout old town. 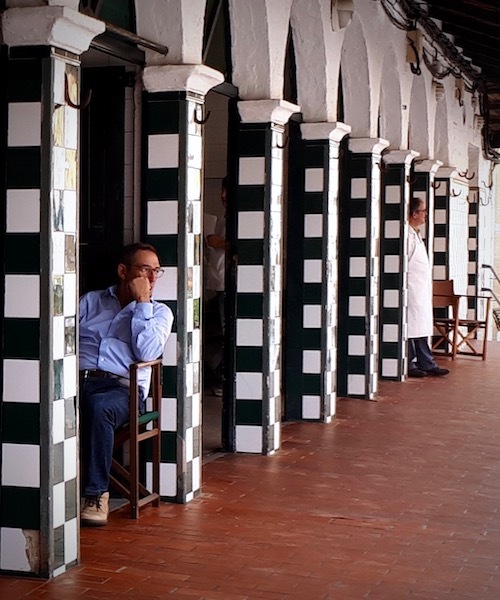 In one of these lovely plazas we discovered the Cloisters of Carmen converted into a beautiful market of food, restaurants, and artisan crafts. If we had more time, we would have enjoyed the Museum of Menorca. It covers industrial and cultural history up to the 19th century but is only open from 10 am – 2 pm most days. More than ten companies manufacture some pretty famous shoes in Menorca. Everywhere I looked I saw the shoe style called the Avarca (a leather sandal with a rubber sole). Not all are authentic nor are they even made in Menorca. The authentic Avarca de Menorca sandals carry a logo created by the Menorca Island Government and Shoe Manufacturer’s Association. Ordinarily, I would check this out closely but I had to keep up with my group who, believe it or not, could actually walk past a shoe store without a glance! Geeze, from high end shops in Ciutadella and Mahón to factory outlets in the interior city of Ferreries, I think we were the only group of travelers who didn’t go to Menorca to buy shoes. At least that’s how effectively the advertising worked on me! Every villa, every residence we passed in Menorca had a gate fashioned of the same style and material. This gate design has a historical significance. In the olden days, carpenters known by the name “Arader” made and repaired all the essential tools used by this farming community. They used the wood from the wild olive tree to make tool handles and gates. 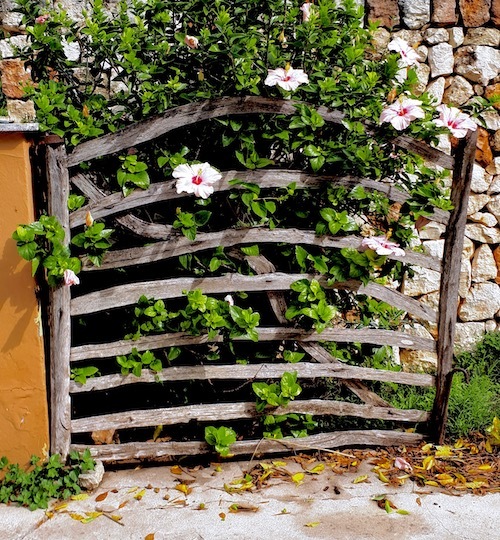 While most tools are no longer hand made, today’s Araders keep the tradition alive with historically correct gates on old and new residences throughout the island. When looking at the ports of Mahón and Cuitadella it is easy to understand how important the Menorcan island was to traders and pirates. Like the rest of Spain, the island was controlled by Romans and Muslims (part of the Caliphate of Córdoba) before the Spanish Crown of Aragon won the battle in 1287. Later, the island was conquered by Great Britain and ceded to British rule in 1708. The Brits didn’t hold the island long before French troops arrived in 1756 to stake their claim. The island flipped back and forth between Britain, France, and Spain for the next 50 years, only formally returning to Spain under a treaty in 1802. Each culture made its mark on the island. It remains a popular vacation destination and permanent residence for many EU nationalities with Great Britain having a particularly strong presence. We noticed that English is spoken widely. Gin production dates back to the 1708 British occupation, as do some of the recipes used by current distilleries. We tried a digestive called Hierba (available in sweet or dry). It was delicious and I recommend starting your trip with a bottle rather than sadly waiting to discover it on your last day like we did. Jamie and I prefer to get around by foot when we are at home or on travel. To see a little more of the countryside, we like to cycle. When that’s not possible, we’ll take the bus or metro. We used all three forms of transportation and one taxi ride while in Menorca. As much as we hate to use cars, we did find ourselves a bit limited in our capacity to see some of the more exquisite beaches on the island. Maybe next time. Grabbing a taxi at the airport was the simplest thing to do when we first arrived but once we got our bearings it was easy to investigate the bus system. Different bus companies serve different parts of the island. The bus company that serves Mahón and the east island is TMSA. Their website was easy to navigate. Much of the information is available in English. It cost only €1,70 to take the bus from Binibeca to Mahón where we transferred to a cross island bus to visit Cuitadella for the day (a one hour ride). The cost for that trip was €5,20 per person each way. Torres is the company operating the airport bus and it cost €2,65 each way with 2 trips an hour in the off-season. Since we had to vacate our villa by 11 am and didn’t have to be at the airport until 4 pm, it made perfect sense to catch the bus to Mahón and stroll around the city. The bus station is just a 10 minute walk from the beautiful city center and port of Mahón. Iberia and Air Europa fly to Menorca via Mallorca but at the time of our trip, Ryan Air flew direct twice a week (Monday and Friday) for a flight that was under an hour. If you’re going to the island for weeks and maybe need to take a car or even a pet, the ferry may be your best transportation mode. It takes about 15 hours and can be spendy during high season. Balearia and Trasmediteranea operate ferries direct from Valencia to Mahón. Oh more shoes and white washed dwellings to get my imagination working! And beaches and disgestifs… oh my, it sounds irresistible. Another one of your amazing trips that is now on my list! 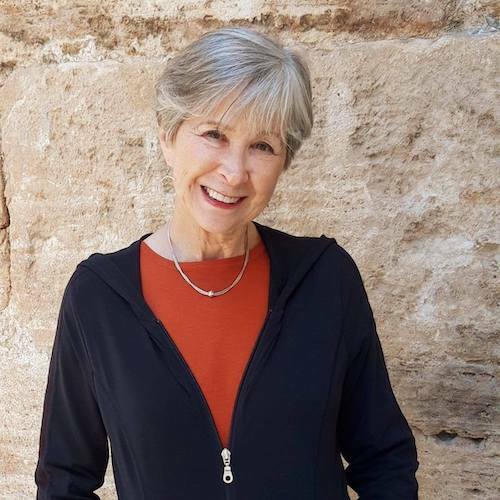 Great read – thanks for sharing. I am putting Menorca on my list of destinations for the next time Walt and I are in Switzerland. Susan, we can go shoe shopping! I am not a “new” shoe buyer, I mostly shop second hand, but I would make an exception! And I would love to have one of those beautiful Arader gates, complete with hibiscus.